The pilot of a private jet that crashed into a Maryland home in 2014, killing a mother and her two small children, did not properly protect the plane against icy conditions, the National Transportation Safety Board (NTSB) said Tuesday. The plane with three people on board crashed Dec. 9, 2014, about a mile from its destination, Montgomery County Airpark. Marie Gemmell and her two young sons, 3-year-old Cole and 2-month-old Devin, died after a plane wing filled with fuel crashed into their house in Gaithersburg, trapping them inside. Gemmell died trying to save her children, investigators have said. Gemmell's husband, Ken Gemmell, and their 5-year-old daughter were not home at the time of the crash. The three men aboard the Embraer EMB-500 Phenom, including the pilot, also were killed. Ken Gemmell thanked the investigators. "This is a good first step," he said. "It was good to know that this accident was preventable, and hopefully down the road this will never happen again with their work today." The NTSB's final report on the crash, released Tuesday, states the pilot did not perform the required checks before he took off from North Carolina. "The National Transportation Safety Board determines that the probable cause of this accident was the pilot's conduct of an approach and structural icing conditions, without turning on the airplane's wing and horizontal stabilizer deice system," board member Robert Sumwalt said. The plane encountered icing conditions while trying to land at the airport, according to the NTSB. The ice accumulated on the wings, causing the plane to stall in midair and then crash. "By not taking possible icing into consideration, the pilot set approach and landing speeds that were too slow for conditions, leading to an aerodynamic stall at an altitude at which a recovery was not possible," the NTSB said in a statement. The board recommends training for pilots to recognize icing. The jet, an Embraer EMB-500/Phenom 100, had no ice-detecting system to warn the pilot of the problem, the NTSB said. 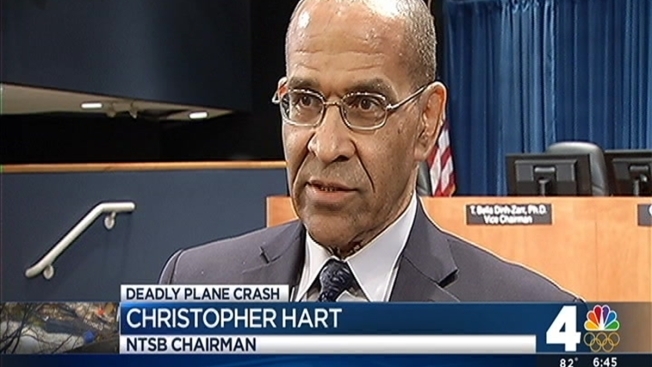 "Because pilots are human and therefore fallible, this crash is a reminder that automated alerts to pilots can and do save lives," board member Christopher Hart said. The private jet reached its slowest speed of the flight shortly before the crash. Two pilots in the area said they observed the plane pitch and roll at steep angles, Sumwalt said in the wake of the crash. The crash raised questions about safety at and around the airport, but the NTSB said it could have occurred anywhere. "Anywhere in the world, if we had those same set of circumstances, the accident would have happened," board member Tim LeBaron said. This was not the pilot's first crash, according to the NTSB. Ken Gemmel and his daughter have moved. Their former house has been rebuilt and is up for sale. The widower is suing the maker and owner of the plane.